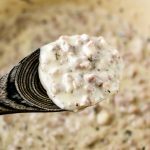 This Paleo & Whole30 Sausage Breakfast Gravy is made using almond milk, broth, coconut cream, and thickened with arrowroot flour for a gluten-free and dairy-free breakfast of champions! Serve over biscuits or potatoes for maximum comfort food status! Place the same pan back over medium heat, and add coconut cream, broth, almond milk, ghee, and all remaining spices (rosemary, basil, garlic powder, thyme, salt & pepper). Whisk well to combine and bring the mixture to a simmer for about 5 minutes. Slowly whisk in the arrowroot flour, adding a little at a time and then whisking, until the starch is gone. Continue whisking until clumps are gone and the gravy has thickened, about 3 minutes. Return the cooked pork sausage to the pan and stir to combine with the gravy. If the gravy is too thick, add 1/2 cup water and whisk. If the gravy is too thin, add 1/2 tablespoon additional arrowroot starch and whisk for an addition 2-3 minutes. Serve with roasted potatoes, avocado and eggs for Whole30, biscuits or toast if not Whole30. Store in an airtight container in the refrigerator and enjoy within 4 days. Adapted from Creamy Sausage and Potato Whole30 Casserole from Whole Kitchen Sink. Nutrition information estimated with My Fitness Pal. Here’s a great recipe for Whole30 Roasted Breakfast Potatoes from Eat the Gains.